Bitter kale is great with pungent, umami-rich and creamy dressings. Bitter kale is great with pungent, umami-rich and creamy dressings. Here are six to try. 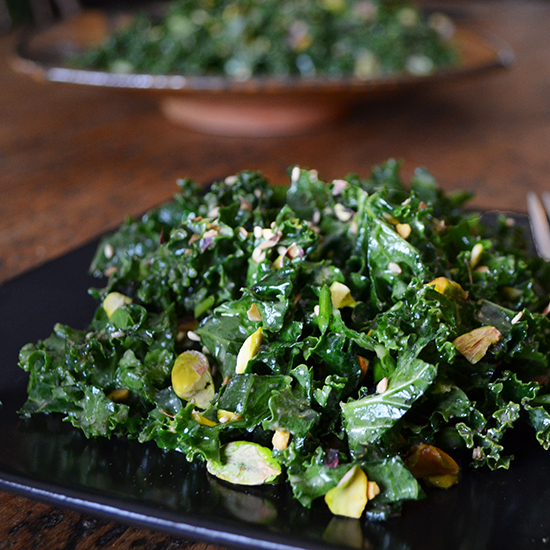 Caesar is probably kale’s most popular dressing. For a healthier take, puree roasted garlic with vinegar, mustard, Worcestershire and a little mayo. Channel your inner Bobby Flay, making a spicy salad dressing sweetened with a bit of honey. Bitter kale is tamed with this umami-rich nutty dressing. Whisk miso with vinegar, sesame seeds, oil and brown sugar for a sweet-and-savory dressing. Kale can handle intense dressings such as this one, made with feta and oregano.